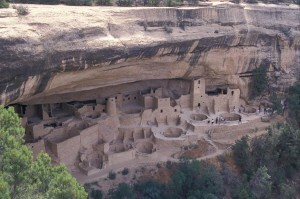 This initiative was a collaboration between the Santa Clara Pueblo Department of Education, the Graduate Program in Historic Preservation at the University of Pennsylvania, and Bandelier National Monument, National Park Service. 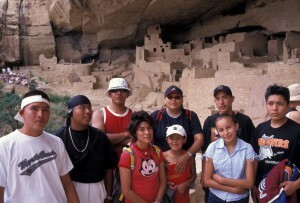 10 Pueblo youth between the ages of 14 and 23 participated in this summer program in July and August 2003. The objective of the program was to raise awareness among the participants about their rich architectural heritage and expose them to basic skills and know-how which would allow them to eventually become involved in the preservation and development of their building traditions and offer them choices as to what kind of physical environment they want to inhabit in the future. This was pursued through a series of field trips to several ancestral sites, training exercises and hands-on activities. During the various field visits, among them to Puye, Bandelier, Aztec National Monument and Mesa Verde National Park, the group met with several native interpretive guides, archaeologists, and architect Dennis Holloway. He showed the group 3-D computer models of Pueblo ancestral sites and let them turn archaeological data of their own ancestral site at Puye into a 3-dimensional rudimentary model. This technology and its potential to help “recover” parts of the past left a tangible impression on the group. 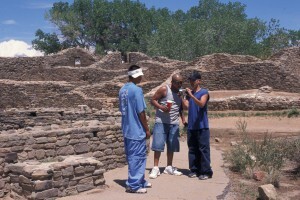 Training exercises included the use of digital cameras to document their favorite buildings or spaces in the Pueblo’s historic area to spur discussions on the development of the village in recent years and the fate of the old adobe structures. They were also taught some basic architectural graphic skills, especially how to prepare plans and sections. The students drew plans of their own homes and were encouraged to develop their vision of an ideal house. Elements of site analysis, use of materials and construction techniques were introduced during this exercise. 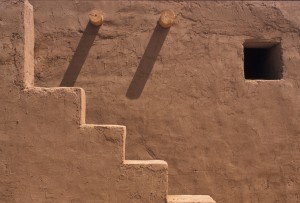 In addition, the group was presented with basic information about adobe construction and the students were shown slides featuring examples of earthen architecture throughout the world. 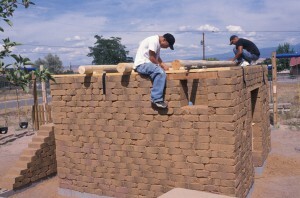 To channel the obviously high levels of impatience, frustration and rebelliousness which characterized the situation in the pueblo, the central activity of the summer program was the design and construction of a small structure in Santa Clara Pueblo, a hands-on experience involving physical activity. The building, a playhouse to be used by the children at the local Head Start Program, was constructed reintroducing traditional formal elements and making use of adobe and “vigas” for the roof. The group participated in the design of the building and identified places within the reservation where materials for the construction were collected such as different soils for the mud-bricks and plasters, grasses for the plaster-mix and willow branches for the roof. 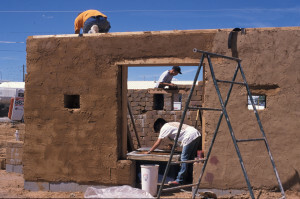 The successful completion of the adobe building conferred a sense of accomplishment that seems to have encouraged some of the students to pursue their interests, to go to college to study design or start taking courses in adobe construction. The response of the community to the project’s activities has been very positive and several people spontaneously expressed their wish to build their own houses in such a manner. The cooperation received from many individuals and from members of different Departments of the Pueblo Administration was extraordinary. First steps to create an architectural heritage archive were undertaken with the identification of several sources of historical photographs.